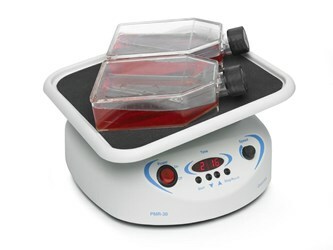 Small but highly functional, the Grant bio PMR-30 fixed angle platform rocker provides a smooth rocking motion for gentle sample agitation. Designed to meet the challenge of workspace restrictions, the PMR-30 rocker is compact, with a low profile and small footprint, fitting neatly into the smallest workspace. The reliable motor produces regulated and reproducible rocking throughout the speed range and, combined with the sturdy construction, will guarantee years of consistent operation. It is also extremely quiet. Compact, sturdy construction with a low profile and small footprint - fits neatly into the smallest workspace. Suitable for mixing applications in many different fields, with specific applications including: gel staining and destaining, antibody staining, washes, hybridisations, immuno precipitations, Southern blots, Western blots, in situs.